So many Barbie-size TV sets! for its electronics and appliance floor, SunSet Malibu PJ! Here is another article that isn't really about the doll, but rather about the doll-size non-Mattel accessories. I now have four 1/6 scale televisions. The oldest is the red-and-white one. It looks like it is a black-and-white TV from the early 1960s. The little disc you see at the top has six cartoon pictures inside: a bunny clown, a jack-in-box, a bear in a band uniform with a drum, an Emmett Kelly-type clown, an Easter bunny, and a boy and girl fox dressed up. There is an eyehole in the back. The TV is marked "NO. 515/MADE IN HONG KONG." This set came with a bunch of miniature items I bought as an adult collector. The big pink TV is the wildest one. It is a combination snow globe and salt-and-pepper shaker! The two sides hold the spices and the lid slides back and forth. The TV scene held water once--there are remnants of snow inside, plus a little cap on the bottom. It's the only item I have with lots of identification: 1963/CLACO/KENILWORTH, N.J./MADE IN HONG KONG/NO. 205. I bought this at an antique show because I couldn't resist it! The green television was purchased in, if I remember correctly, 1970. The picture is holographic and you can see the girl ice skater twirling, while a silhouette of a male falls on the ice. The back is marked A&W PROD./1962. Believe it or not, this is a pencil sharpener. My sister got this TV as a little girl and I got a tiny pencil sharpener that was a globe (which unfortunately is long gone). My other sister found the blue Kings Island TV for me at a garage sale. Like the red TV, it has a view hole in the back with a button you press on the bottom to change the pictures inside. There are a number of pictures of the park's original rides. The theme park opened in 1972, and the TV looks like something from the early 1970s, but one of the photos inside is of the Screamin' Demon looped roller coaster, which opened in 1977. I suspect at some point the photos inside were updated. It's my theory that all of these TVs were made by the same Hong Kong factory that made the tiny Nativity sets that I showed you before Christmas, as the miniatures have many similarities. The doll with the TVs is a 1972 SunSet Malibu PJ in 3486 O Boy Corduroy, also from 1972. I've made up a little story about the picture I am showing you. and All-American Kira all wear knitted accessories. Unless you personally know the history of a knitted item of Barbie-size clothing, you will likely never know its age or maker. I can tell you about five of the yarn pieces in this photo. Pizza Hut Skipper and Fun to Dress Barbie wear Christmas tree ornament sweaters that were purchased sometime since 2000. Straight leg Skipper wears a poncho and Becky wears a cap that were crocheted for my sisters' dolls by a neighbor in the early 1970s. I knitted the tan scarf that Kira wears myself after I took a knitting class sometime in the 21st century and learned how to do the crossover stitches. The others are a mystery and came with piles of used doll clothes that I bought over the years. 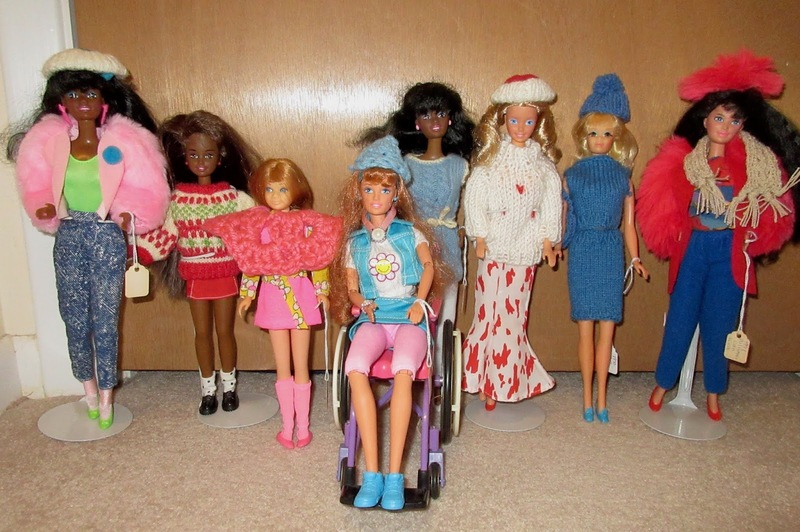 The caps that Devon and Fun to Dress Barbie wear are circles of corduroy that have a white knitted trim. 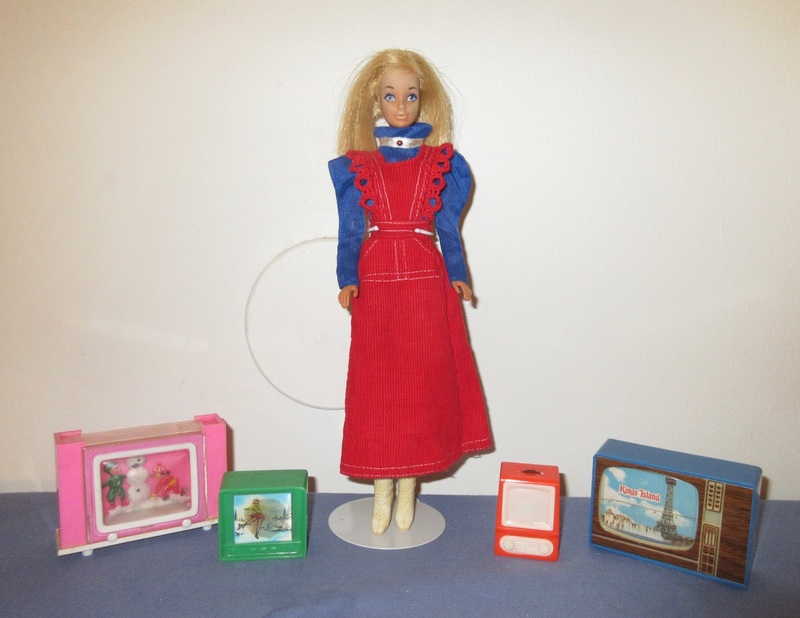 The blue items on PJ are a matched set--skirt, top, purse and cap. I assume they are from the 1980s because jewel tones were popular that decade and sweater dresses were also popular. They may have been hand-made. I assume that the light blue tunic worn by Bathtime Fun Barbie is from the 1960s and was purchased. Reasons? The stitches are way too tiny and perfect to have been made by a human. The other reason is that the sweater is actually wool and not worsted, and there aren't that many genuine wool Barbie-size outfits out there. That sweater must itch like crazy!